Learning & Development is the business function that time forgot. Technology is primitive: AICC and SCORM are 20 years old; even xAPI has been around since 2011; unsupported browsers like IE8 are commonplace in many firms; the UX of many learning systems is a 90s throwback. Content is stale: vast but substantially outdated content libraries sit unused on corporate LMSs, intranets, extranets, SharePoint etc. Research is outdated: Ebbinghaus’s forgetting curve is 100 years old and that’s one of the few learning mantras with some research to back it up. But there’s a chance to catch up with and even overtake modern business. To do that we need to look beyond where workplace technology is now, at where it’s going. 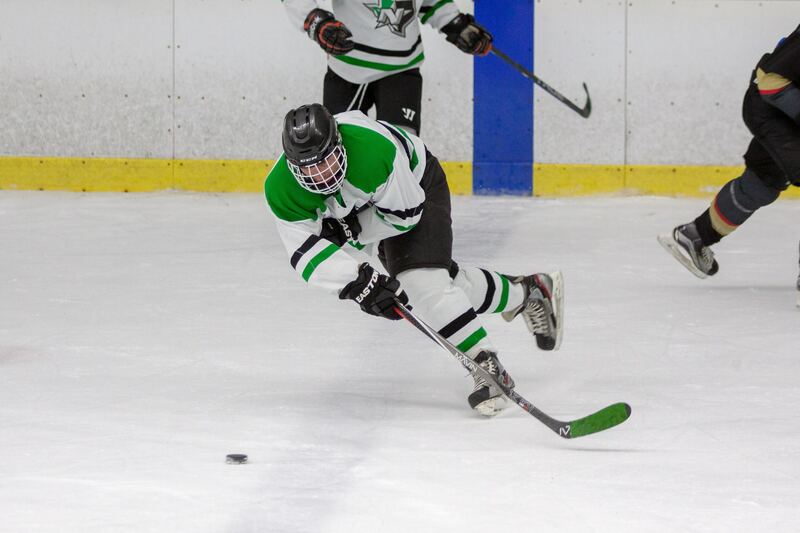 Who cares where the puck is now? We need to know where it’s going to be by the time we can get there. 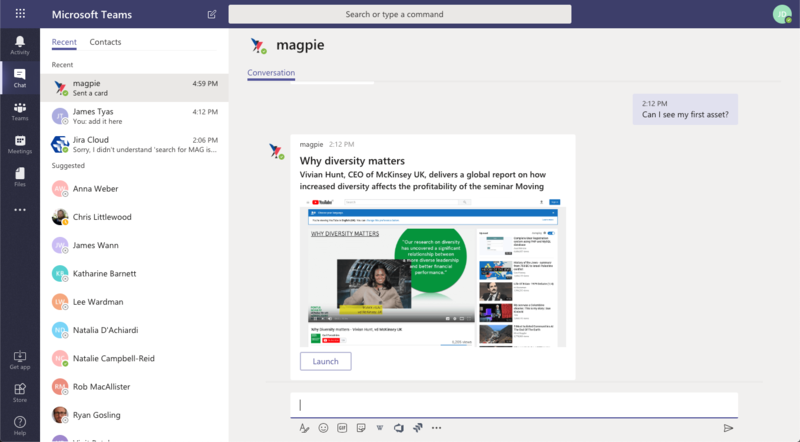 Well, the puck is going to Microsoft Teams, the fastest growing application in the company’s history. Most of the predictions of the future of work (and there is so much of it these days) are hot air. It’s virtually impossible to use any of it to make tangible decisions and plans today. This data (see growth) and logic-backed (Microsoft is, actually, everywhere) forecast of the near-future of work is immediately applicable today. How can Teams help you? Assuming then, that Teams will be very successful very soon, how might this be useful for you? Two ways, mainly. 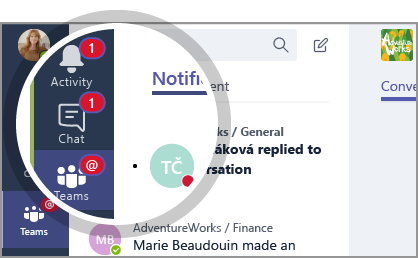 And if that notification is smart enough (take a look at this delicious content for this great reason), the user is intrigued and drawn in straight to the actual content (not a LMS home screen), further reducing the friction that too often impedes learning. Second, being in Teams gets learning right into the flow of work. This is about more than just reducing the administrative friction. When a user is in a designated learning place (learning experience platform, learning management system, virtual learning environment, etc), there is little prospect of taking a cue from the actual workflow to augment or personalize or improve what gets learned. But being in Teams unlocks many possibilities, some of which I’ll talk about below. There are broadly three ways to integrate with Teams, all using APIs. I’ve drawn from this excellent article in the below how-to. 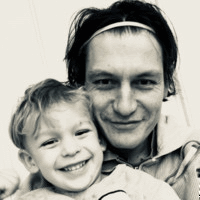 You’ll need to specify with IT that you’ll need single-sign-on with the Azure Active Directory instance that the MS-Teams user base connects to, or your users’ Teams experience will not sync with the native version of your learning software. Although Tabs is in a sense the most extensive integration (you get the full-fat version of whatever software you’re integrating), it’s also the easiest as it’s just an iframe (done very nicely by Microsoft). So this solution requires the least planning and mapping out so you can get started relatively quickly. The main benefit to adding a Teams tab is the reduction of learning-inhibitive friction, ie the shortcut you’re providing for your workforce. Bots. Chatbots enable a more interactive experience with the user. Any bot you add needs to be approved by and appear on the Microsoft Bot Directory so either create your own and get it approved (a lot of work) or use an already-approved bot (a lot less work). Connectors. Think of a connector as an API wrapper that enables Teams to talk to other software like Twitter, Skype or your learning technology. Connectors provide the widest range of options for deep integration in Teams and therefore take the most forethought and technical work. Are we using Azure Active Directory AAD or AzureAD as our single-sign-on identity provider? Learning-in-Teams might actually fulfill the promise of learning technology. To borrow Slack’s tagline, Teams is where work happens. So with the right permissions, parsing text from Teams is possible; it could look out for keywords or shared links or even try to understand the intents behind the natural language of users. This means that the solution doesn’t need to rely on explicit input from the user to interject helpfully; it can just quietly observe and pipe up when it’s sure it has something good for the user. This is a substantial realisation of the learning in the flow of work dream. But maybe learning, smack bang in the middle of the flow of work, is not always exactly what a user needs. Think about it - we want something pretty nuanced here. We’re not talking about specific pulls of information that people already get via a Google / YouTube / intranet search. That’s a different problem (known-unknowns - see 2x2 below) which is solved as soon as your collective array of information is searchable (still a way off for many companies). The problem here is that of the unknown-unknowns (bottom-right quadrant in above) and the possibility of using a large, relevant, live, new data source (messages shared on Teams) to inform recommendations drawn from that vast pool. But is it most useful to receive a recommendation? Does the user want to get even a short 5-minute article there and then as she’s collaborating with colleagues, thereby interrupting her workflow? How about a delayed communication (perhaps by email) which goes to her the next day, in time for her morning commute, saying something like: ‘saw you were talking about blockchain today...here’s the highest rated content by people in your industry over the past month’? Perhaps the ideal arrangement here is actually a looser coupling (rather than a tight, rigid relationship) between work and learning, at least for leveraging unknown-unknowns. Further ahead (beyond the near-term), I think and have argued that this kind of intelligent learning guidance will happen via b2c software in our pockets, such as Siri and Google Assistant. But even Apple and Google are a couple of years away from that. If you’re interested in telling us and finding out how strong the surge to Teams is, please participate in this 4-question poll (anonymously, if you want). 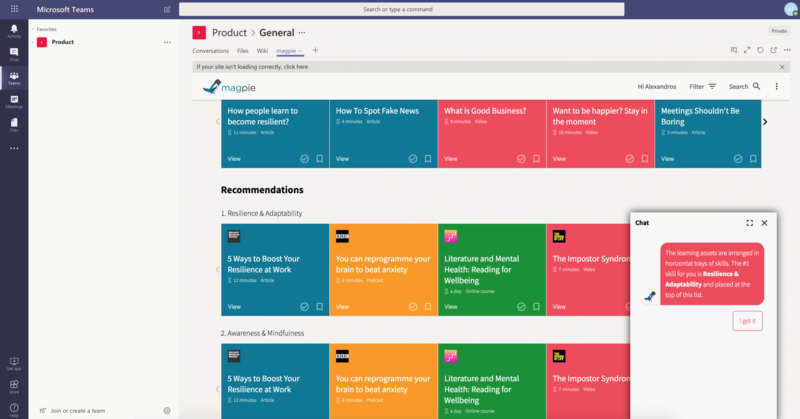 And if you are interested in joining a small number of very forward-thinking companies that we’re experimenting with to bring learning systems - ie magpie - and Microsoft Teams together, please be in touch with me (marc@filtered.com) or any of the team. *they (Microsoft) should coin that phrase.